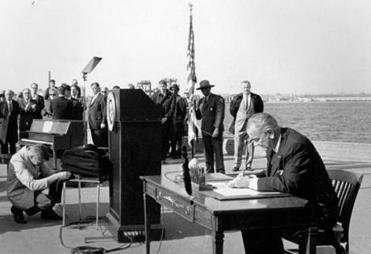 When President Lyndon Johnson signed a bill reforming the nation’s immigration system on Oct. 3, 1965, Boston was about midway through its infamous postwar slide. By the end of that decade, the city had lost more than 20 percent of its population and more than 40 percent of its manufacturing jobs since 1950. As the tax base shrunk, the follow-on effects were readily apparent: rundown housing, deteriorating schools, vacant storefronts, and neighborhoods scarred by urban renewal and growing racial tensions. There was no reason to suspect that liberalizing immigration policy would have any effect on this deepening malaise — indeed, many worried that it would make matters worse. By the mid-1980s though, the city was rebounding. The postwar dream of a “New Boston” began to take shape as the region’s high-tech, medical, and scientific sectors blossomed. With new investment and an expanding job market, the city’s population began to grow again, and a new vitality was evident in some Boston neighborhoods. But still, few saw any connection between the changes brought by the 1965 Immigration and Nationality Act and the impressive urban renaissance that was then well underway. In retrospect, however, it is clear that the 1965 legislation was a critical turning point. By eliminating the old national and racial quotas, which favored migrants from northern and western Europe, and expanding preferences and exemptions for skilled workers and the family members of newcomers, the act markedly increased the volume and diversity of immigration. In Boston, immigrants from China, Haiti, and the Dominican Republic saw the biggest gains. Flows of refugees during the Cold War also brought newcomers from Cuba, Vietnam, and the Soviet Union, while global conflicts in the 1980s and after brought new arrivals from Central America, Africa, and the Middle East. By the 21st century, the city’s foreign-born population was strikingly more diverse, even compared to past immigration waves. In 1910, newcomers from Ireland, Italy, Russia, and Canada made up more than three-quarters of the city’s foreign-born population. A hundred years later, the top immigrant groups hailed from more than two dozen different countries — mainly from Asia, Latin America, and the Caribbean. Together, these groups turned Boston into a majority nonwhite city by the late 1990s. What’s more, in addition to shifting demographics, immigrants have sustained the labor force. After 50 years of decline, Boston’s population began to rise again in the 1980s. The gains were wholly due to immigration, as the US-born population continued to age and shrink. In 2010, the native-born population finally showed a slight increase, due in part to a growing second generation of the native-born children of immigrants. As these young people come of age in the next decade, they will help offset the sharp declines in the native-born workforce as the baby boomers retire. New England’s history with migrants paved the way for the rest of the nation. 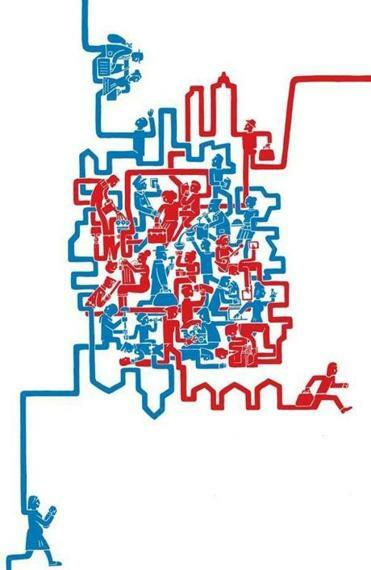 Immigrant workers have provided the labor for Boston’s new economy at both the upper and lower ends. On the one hand, immigrants have joined the ranks of scientific and professional workers in the medical, high-tech, and education fields, providing essential skills and talent for the region’s knowledge economy. At the same time, they have also filled the vast array of lower-paid service jobs that buttress that economy. More affluent dual-earner families have come to rely on immigrants who provide a multitude of services such as child care, elder care, housecleaning, yard work, and food services. Moreover, newcomers have also founded thousands of small businesses, from neighborhood bodegas and restaurants, to startups in software and biotech. Although critics have long bemoaned the “immigrant invasion” and the presumed economic displacement it causes, the reality is that Boston’s economy — like that of New York, Chicago, Philadelphia, and many other cities — very much depends on an infusion of young immigrant workers. Over the past 50 years, these newcomers have invested their wages not only in their native countries but also in homes and businesses in many of the city’s hardest-hit neighborhoods. As middle- and working-class whites fled to the suburbs, Latino, Asian, and Caribbean immigrants purchased aging homes and triple-deckers for their families and relatives, just as earlier immigrants had done. Some started businesses nearby, reopening boarded-up storefronts and reviving declining commercial areas. And as Harvard sociologist Robert Sampson has argued, the growing population and more lively street life of many immigrant districts also tended to make them safer and less vulnerable to crime. Areas like Jamaica Plain, East Boston, Allston, Mattapan, Fields Corner, and other parts of Dorchester have all reaped at least some of these benefits. A number of the region’s older inner-ring suburbs have seen similar immigrant-led revivals, including places like Quincy, Somerville, Everett, and Malden. Through their tax dollars, investment, and sweat equity, new immigrants have helped rebuild both the tax base and the local retail sectors of many communities. Of course, as with past periods of immigration, the fruits of that labor have not always been equally shared. Growing inequalities have characterized the new economy that immigrants helped build, and those at the lower end of the occupational ladder have struggled to survive in an increasingly unaffordable city. Even as they have reinvigorated the region’s labor market, newcomers have been subject to exploitation, weak labor regulations and enforcement, and a minimum wage rate that has lagged well behind the cost of living. And in a frustrating twist, newcomers that helped spark urban revitalization have often been priced out of these same communities as redevelopment and gentrification took hold. Since 1965, poor and working-class immigrants have experienced a metropolitan migration from older central areas such as Chinatown, the South End, and East Cambridge, to outlying neighborhoods and inner ring suburbs. That pattern continues — escalating property values and rents have priced many immigrants out of Jamaica Plain, Allston, Somerville, and other up-and-coming neighborhoods. Immigration alone did not bring about Boston’s renaissance — globalization, technological innovation, government funding for education, medicine, and urban redevelopment, and a host of other factors were crucial. But its importance as catalyst also can’t be denied — without newcomers’ skills, labor power, community investment, and cultural contributions, it is hard to imagine the city taking quite the same form.